As camera makers struggle to innovate, consumers are finding little need to upgrade. The market is slowing to the point of inertia—manufacturers need to take a left field approach to stay competitive. In February, Nikon—the world’s second-biggest camera manufacturer by market share—published a notice of “recognition of extraordinary loss.” The statement admitted that, over the last nine months of 2016, the company had lost $260m. Following this announcement, Nikon’s share price plummeted 15 percent and loyal customers were sent into a panic. Photographers tend to invest a lot of money in a camera system, purchasing multiple lenses and camera bodies designed to work together. For the millions invested in the Nikon system, the announcement exacerbated existing fears about the decline of the digital camera industry and it’s key players. Promuser’s Global Digital Camera Report for January 2017 confirmed that total digital camera production is dropping steadily, and is currently less than half the most recent high-point—the 45 million units produced in October 2014. The number of units shipped is also falling—it was down 1.6 percent year-on-year in January, with no signs of improvement for the rest of the year. This decline is curious, at least in the way that it has played out. Aside from Nikon, few if any leading manufacturers have acknowledged that there is any problem. The former cancelled its planned DL series of mirrorless (high-end compact) cameras in the wake of the loss announcement, but market leader Canon released its newest professional model—the EOS 5D Mk IV—in September last year. The camera was universally recognized as an excellent, capable piece of technology, but a unifying feature of reviews was the suggestion that Canon had not changed enough from the previous model—the Mk III—to justify the upgrade. I’m so impressed that Canon chose to introduce this 5D Mk IV. Canon didn’t need to; it already has [most features] covered in the 5D Mk III. The 5D series sells very few cameras compared to Canon’s [consumer level] DSLRs, so we ought to be glad that Canon actively develops new models that don’t do much for profits (and eat into sales of other Canon cameras), but give us all more camera choices. The response perfectly encapsulates one of the market’s main problems: a lack of innovation. Unlike in other stagnating areas of technology—such as laptops and televisions—no complete alternative has yet superseded digital cameras. They are still widely used and appreciated, especially at a professional level where tiny smartphone cameras cannot compete, but the incentive to regularly upgrade is being eroded. Metrics that once drove camera upgrades, such as megapixel counts and sensor sizes, are being widely called into question. Canon users, for example, spent many years clamoring for greater megapixel counts, culminating in 2015’s EOS 5DS and 5DSR models with staggering 50.6MP sensors. Around the same time, Fujifilm set about releasing a range of attractive, functional cameras with much more humble 16 megapixel sensors (now increased to 24 megapixels), but still marketed at professionals. The range was a critical and financial success, proving that ergonomics and build quality matter more than abstruse technical specifications. 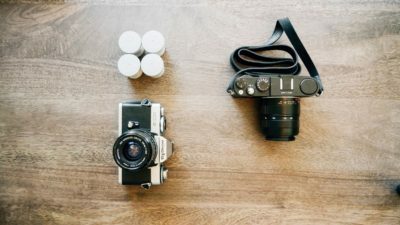 The rise of Fujifilm as a serious competitor to Canon and Nikon—alongside other mirrorless manufacturers such as Sony and Olympus—has spread customers much more thinly than before. Manufacturers need significant innovation in order to stand out, and yet innovation is exactly what the industry is currently lacking. Canon makes its own digital sensors, but the majority of other major manufacturers (including Nikon and Fujifilm) actually use Sony sensors, making the market surprisingly uniform. “I’m not a camera engineer, but I think there may be some head-scratching going on in the labs regarding which direction to take technology”, noted Mullins. It’s often obscured by superficial features, but the fact is most high-end digital cameras are exactly the same as one another, and the same as older models from the last five years. What’s more, there’s little prospect of them changing much in the near future. As a result, there’s little incentive to upgrade as often as manufacturers would like, which is behind sluggish sales and rapidly stagnating production levels. The problem manufacturers face now is how to move on from direct innovation. Launching new models with obscure specification tweaks is barely keeping leading brands afloat—a radical rethink is required. Fujifilm, continuing the imaginative streak that saw the company rival the dominance of Canon and Nikon, may have found the answer. From vinyl records to Hollywood films on celluloid, analogue media has made an astonishing comeback. Photography, not so long ago, was also an entirely analogue process, and film photography is now being embraced in a big way by consumers looking for something new. It may sound strange to describe film as “something new,” but a 2015 survey by UK manufacturer Ilford Photo found that 30 percent of film users were under 35 years old, and 60 percent had only started using the medium in the last five years. This burgeoning trend has not been lost on Fujifilm, and the company has started to put significant weight behind its Instax range of instant film cameras. Though launched in 1998, sales have only recently taken off: in 2004 only 100,000 Instax units were sold, whereas 2015/16 saw the figure skyrocket to five million. Instax cameras are firmly marketed at a young demographic, with bright plastic bodies and fashionable limited editions in collaboration with the likes of Michael Kors. This strategy, a world away from the fusty, specification-focused world of digital cameras, has proved incredibly successful—in the 2015/16 financial year, Instax cameras outsold Fujifilm’s own digital cameras almost four times over. Slowly, this astonishing success is being recognized by competitors. German luxury camera maker Leica, whose flagship products easily clear the £5,000 mark, recently launched the Sofort—an instant camera only slightly more expensive than the Instax range, and squarely aimed at marketing the concept to a more serious, adult crowd. As digital camera sales continue to slow and manufacturers struggle to excite consumers, the key players would do well to stop ignoring the rebirth of analogue media. The potential for growth is clear, and the opportunity to take film camera sales away from the second-hand market is staring camera makers in the face. It will take courage to invest in what many still see as a ‘dead’ medium, but the rewards are clear to see: an exciting, largely untapped market awaits. About the author: Temoor Iqbal is a London-based street photographer. You can see more of his work through Instagram and Twitter. This article originally appeared on The New Economy. ⟵What Color Should Your Logo Be?